I am glad you stopped in today as I have more pictures to share of our little Gardeners Cottage that this time of year becomes The Christmas Cottage. I have had fun decorating it for our Christmas house tour coming up on December 10th..
Each year I like to give it a little different look. So this year it is more of a french country theme. The quilt on the bed is Marie Antoinette -a taupe and cream toile. I bought these old skates at a thrift shop and gave them a coat of grey stain. The tree and all the decorations where Dollar Store or thrift store finds. 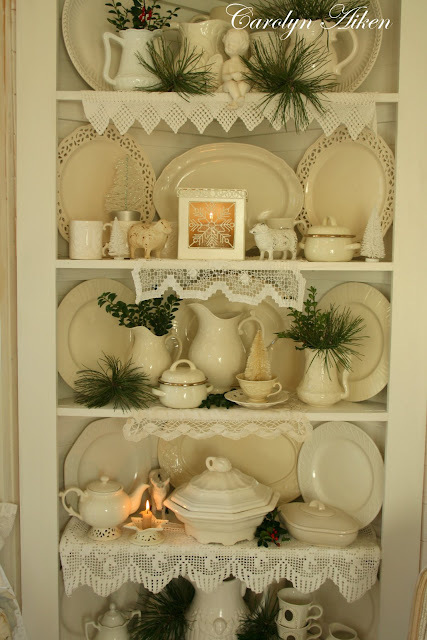 The cupboard in the corner was built for me in the summer and now holds my cream dishes with some greenery for the season. This little electric stove was a gift from my daughter and I gave it a coat of ivory paint .It gives a little bit of heat to take the chill out on cool days and adds some ambiance.The mirror is the top of a yardsale dresser but it works good here.also. These chairs were also a second hand store find a few years ago but I did have them recovered.I gave the wood a wash of ivory paint. The netting over the bed was also a yard sale find-it adds a romantic touch. Some gifts under the tree-aren't they cute??? 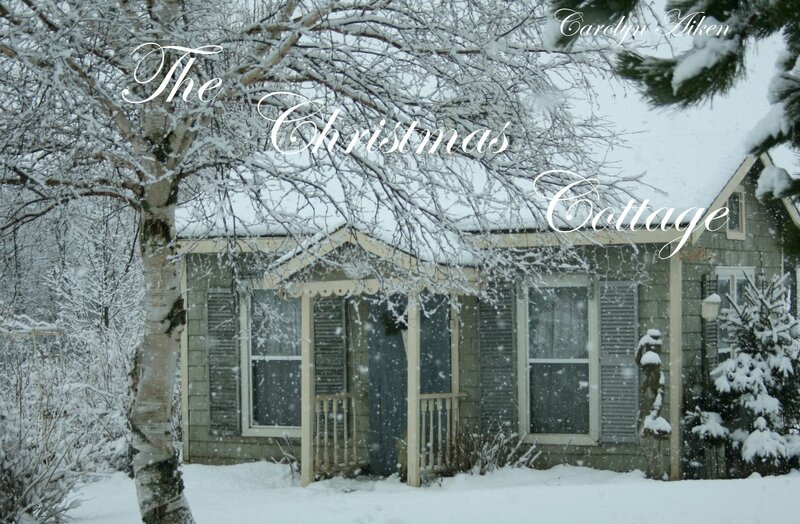 Our Christmas Cottage last winter. 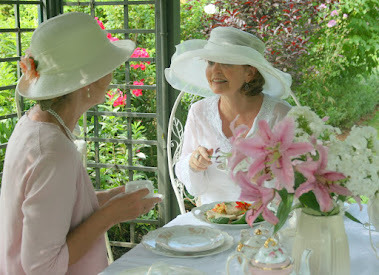 I am joining French Country Cottage for Feathered Nest Friday and My Romantic Home for Show and Tell Friday where there is lots for you to enjoy.I am also joining Haken for Show Off Saturday. I hope you enjoyed a peek inside The Christmas Cottage. 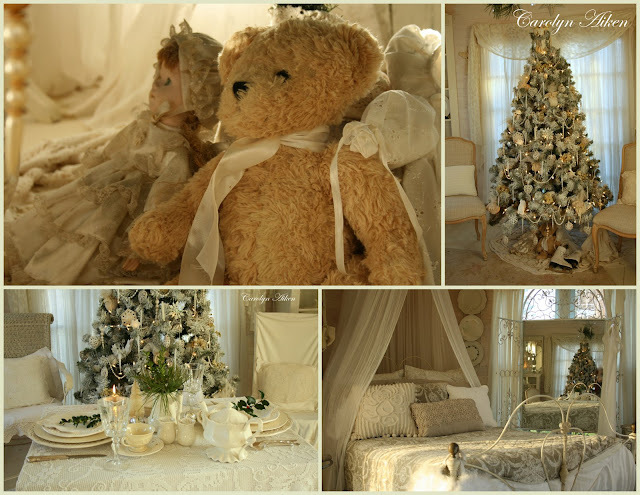 What a beautiful room,,, I just adore it all.... 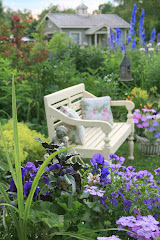 I never tire of looking at all your lovely photos of your home a garden... thanks for sharing. Wonderful job Carolyn.. it looks so inviting. Your guests on the tour will think they are in Heaven. Take care.. Spectacular! 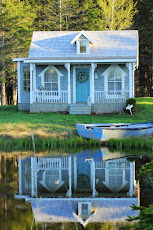 Your little cottage is adorable and so beautifully decorated. The cottage looks perfect and is sure to be a hit for your tour! I love it all, especially the bed, and the new corner cabinet! I love your blog, I think it's my favorite of them all! I especially love when you use your red transferware- I have a small collection as well, and never tire of looking at them in my cupboard. Thanks for sharing all the ideas! The tour is going to be so exciting! How many homes for the holidays will be open to the public? 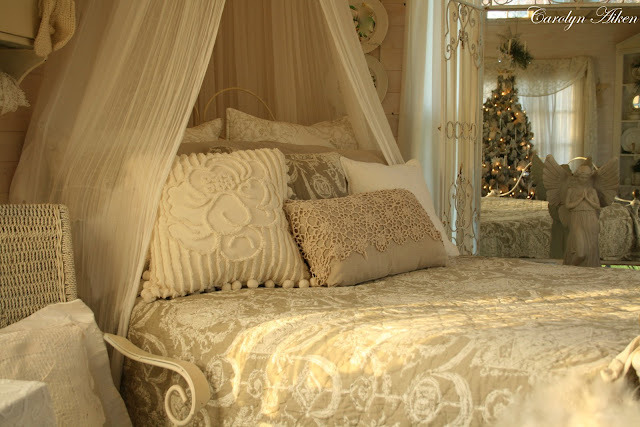 It's just beautiful and restful. 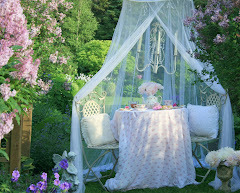 What a lovely spot for reading and sipping some tea! Dearest Carolyn, You have outdone yourself! Absolutely love your decorating touches! The colors are so soothing and I think it's awesome what you have done. PLEASE make a Calendar! PLEZZZZZZZ. Have a sweet week and God bless. Words escape me! I've never seen anything more gorgeous!! WOW!!!!! 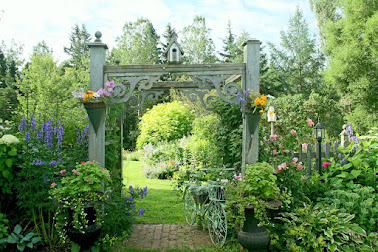 Hi Carolyn... just discovered your blog for the first time, and I am loving your beautiful cottage and garden. Looking forward to following along. I think this is the prettiest the cottage has looked! I love all the creaminess and every sweet detail. Wish I could see it in person! I want o live in it! Gorgeous! This must be a lot of work - it's really beautiful!! HI Carolyn! Oh, I just love your little space and it's so magical and charming! You decorate so beautifully. 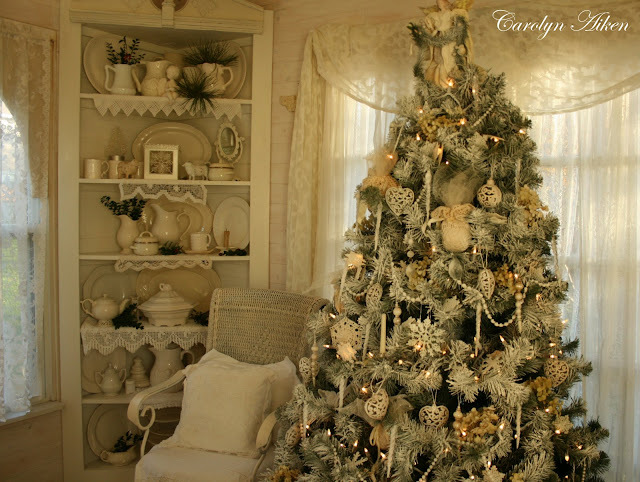 Yes, I enjoyed looking around your delightful christmas cottage...the monochromatic color scheme makes a very elegant statement; all the varied textures and subtle hints of color provide great visual interest as well. Simply breathtaking! Your little cottage is wonderful. I would love to have a lovely spot like that to play in. Hi Carolyn, I love your new theme for this year! It's charming and sophisticated at the same time. 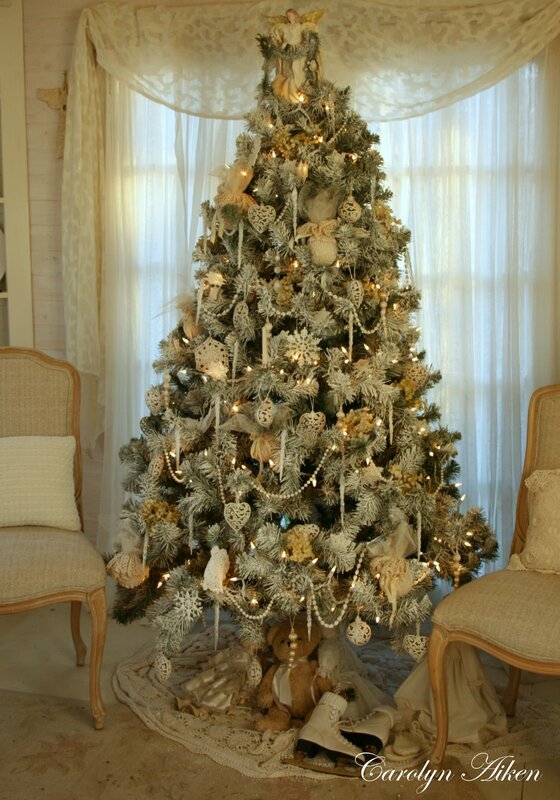 So glad to be able to enjoy your decorating as I doubt I will get to it this year. Beautiful job as always. Nothing sort of dreamy. What a lovely place--hardly looks real! Man weiss gar nicht,wo man zuerst schauen soll,so zauberhaft. 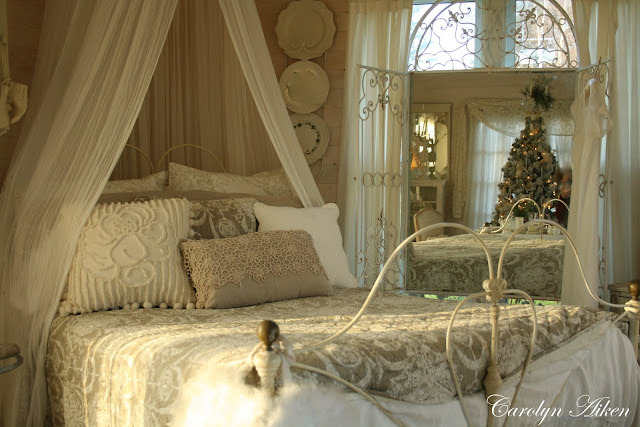 Carolyn, lovely bedroom, it's so romantic. Cozy photos! PS: do you have snow already? This is so, so, so beautiful... I like everything in this cottage ! 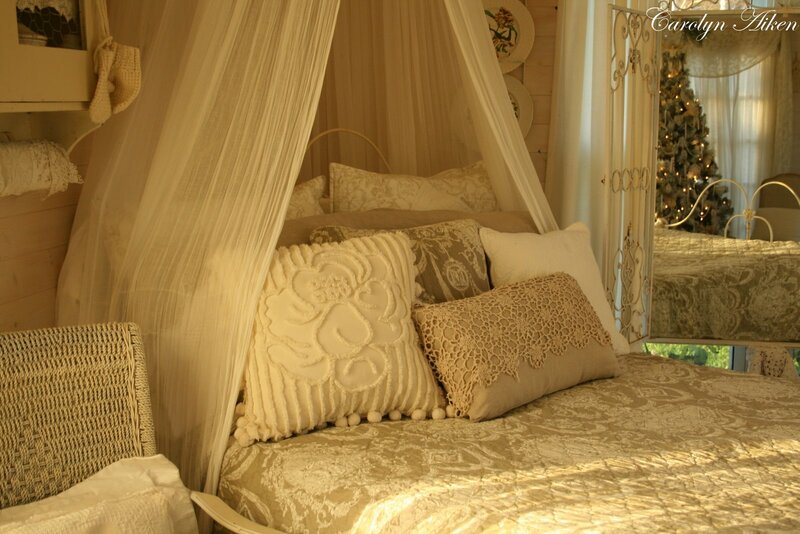 Your cottage looks so romantic! I have been scrolling through your photo's several time now. There is so much to see on each one of them. You must have been at work for days, making it all look this beautiful. I didn't know you did Christmas tours as well. It sounds like so much fun! Love these images. Staining the skates was a brilliant idea. I often see interesting things, but I sometimes bring them home before I have a plan. 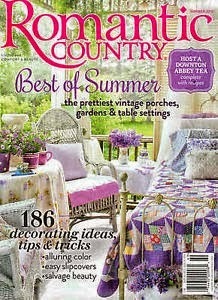 Your cottage is gorgeous! Thanks for sharing! I'm gazing at this beauty! 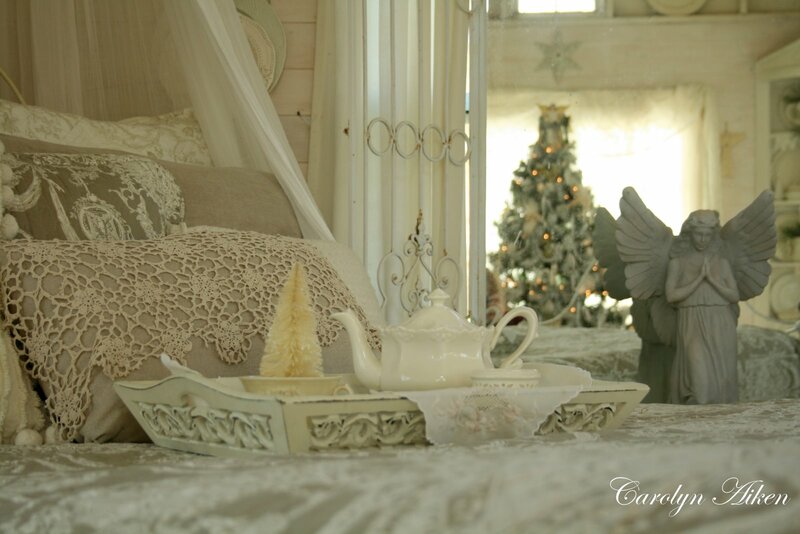 if I were dreaming of a beautiful home for Christmas I would dream that something very much like your home! You did a great job, you're really smart! Even the artist's touch of gray shoes for brushing the ice! 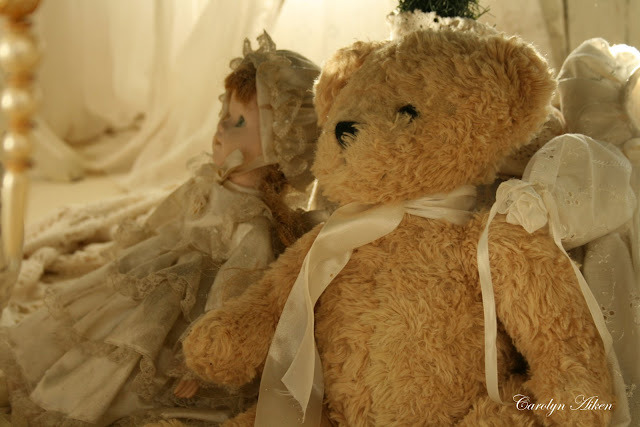 is really all incredibly nice and made ​​with great attention to detail, I love it all! I think that your will be a wonderful Christmas! Great! Simply heavenly! I am adoring each and every detail. Thank you so much for sharing this beautiful cottage! So lovely! I wish I lived close enough to take the Christmas House Tour. Absolute magic, Carolyn! It really is! I've been looking forward to seeing more since your little sneak peek. I know you have enjoyed your Thanksgiving Holiday but I just wanted to wish you another Happy Thanksgiving from the USA...I'm sure you will enjoy the day in your beautiful home. Amazingly beautiful!! I could look at your photos all day long! LOVE it!! Stunning! The cottage is simply divine. I love it! I wouldn't get out of bed if that was my room, snug under the blanket enjoying every corner of your beautiful room. Last year's picture of the cottage is a perfect postcard view. That looks so cozy, I could just move in :o). You always do a beautiful job decorating. I am so glad you share with us - for those who will not be able to come to your tour - someday - I hope, I hope! The first word that came to mind was serenity! I hope all goes well for you! Wow what a beautiful bed you made up Carolyn. I love that taupe toile quilt. Where did you get it? And don't say the thrift store~lol! The cottage is christmas perfection! I think you would like the movie "The Christmas Lodge" - by Thomas Kinkade. I notice that alot of Hallmark movies are actually filmed in Canada. The lodge is like his painting "The Christmas Cottage" Your cottage is always so lovely and I agree - it is fun to try things in new places. 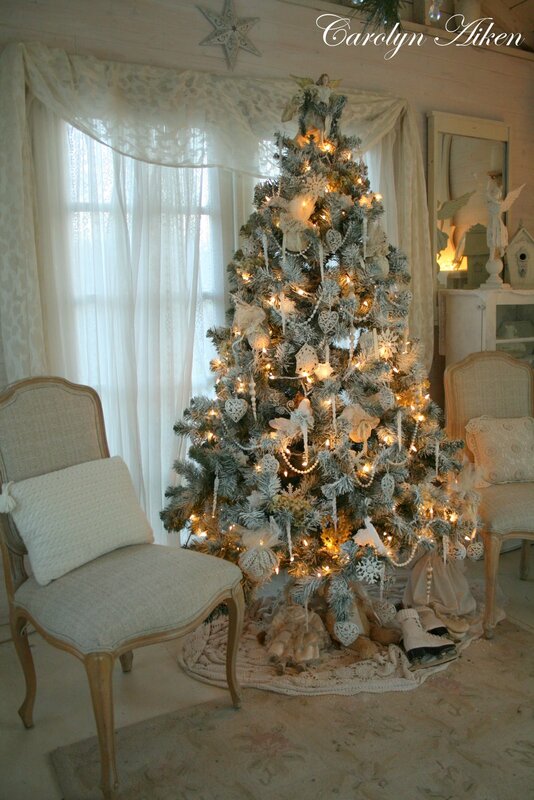 I just came from your Christmas blog, and am amazed at the transformation!! 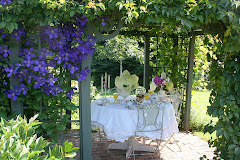 Your French Country Cottage is Stunning and so elegant!! 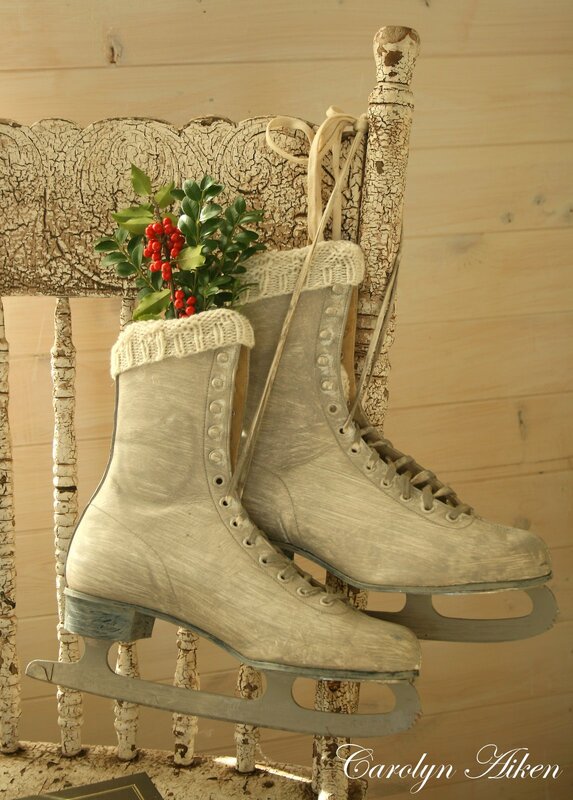 I never would have thought to stain my old skates, what a fun idea! Carolyn, This is so beautiful it takes my breath away. nancysellstransferware@gmail.com (on my sidebar, upper right side as well). 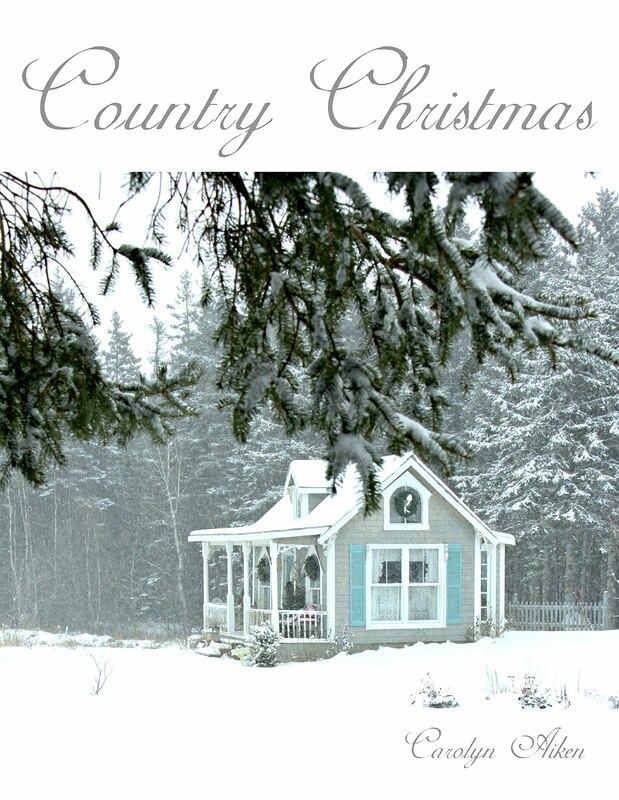 What a magical place...a Christmas Cottage sounds and looks perfect for the holidays!! Absolutely gorgeous! Have a Blessed Holiday Season! 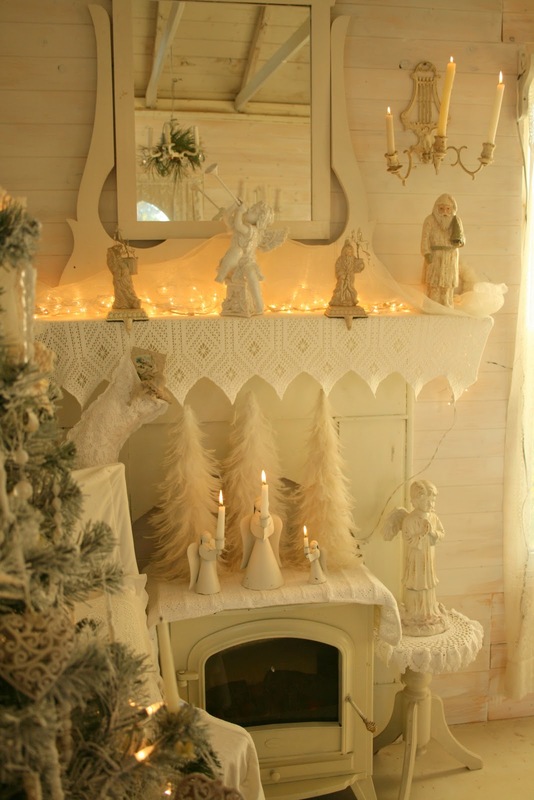 Your Christmas cottage is absolutely stunning. 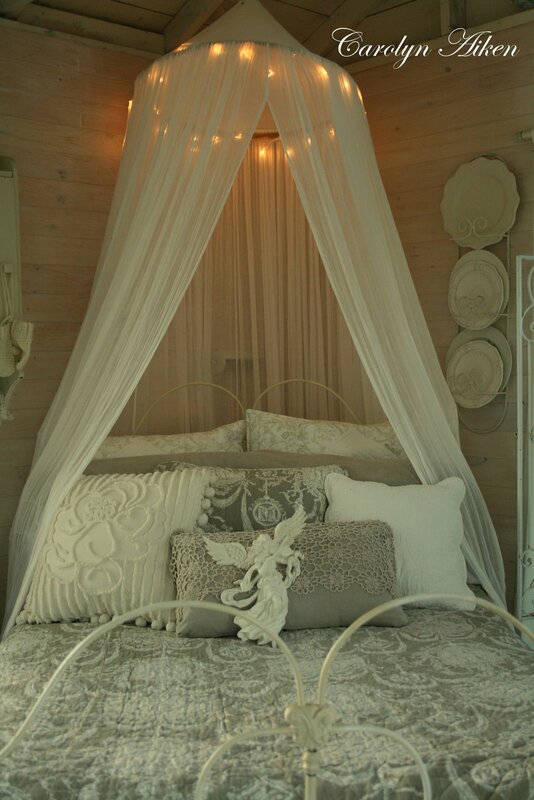 I love the neutral color pallette you used, so calm and serene. 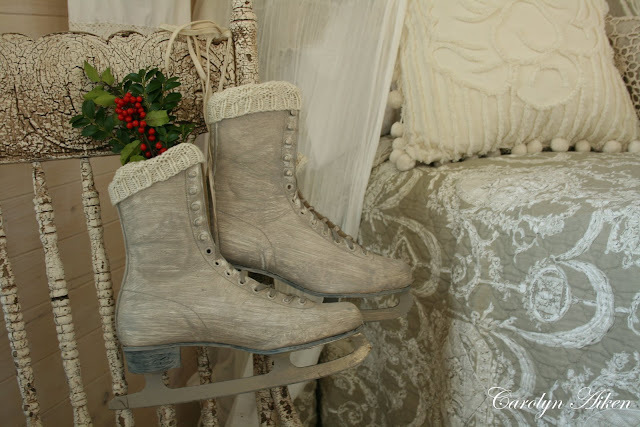 The ice skates are wonderful and love the toys under the tree. It is all very lovely. I LOVE the beauty in this room. 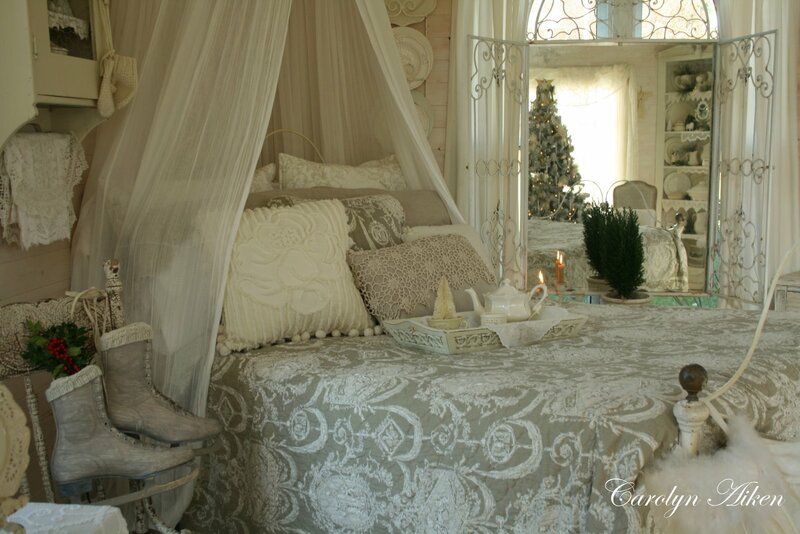 I am also a lover of taupes and creams and whites. I have whiteware too and it just goes so nicely with any decor. 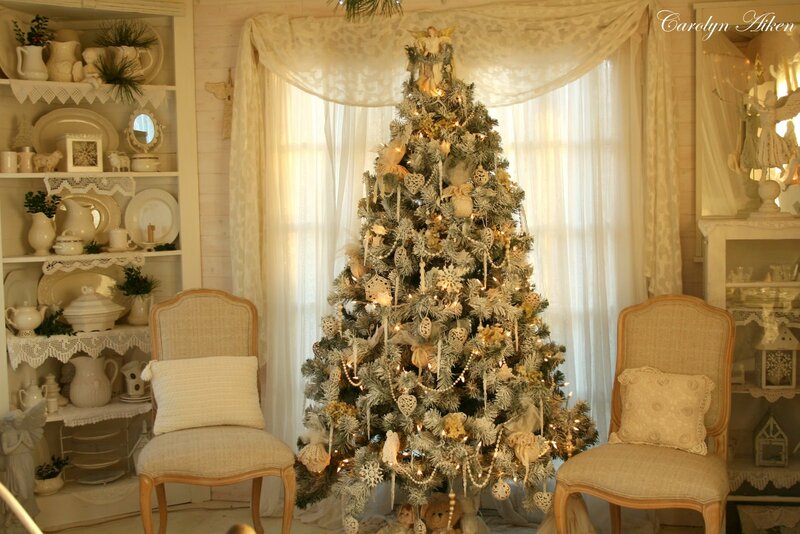 Your decorating takes my breath away. 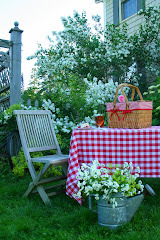 I simply adore your blog! 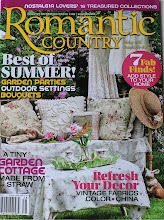 You have a great eye for country chic/shabby chic and you have make your space a little romantic haven! Great job and continue having fun!